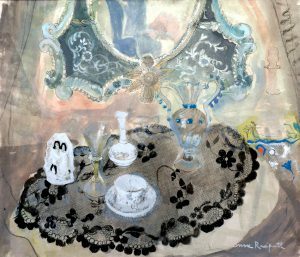 Anne Redpath grew up in the Scottish Borders and enrolled in Edinburgh College of Art in 1913, graduating with a travelling scholarship which she used to visit Brussels, Bruges, Paris and Italy. After a long spell living in France with her husband and children, in 1934 she returned permanently to Scotland and became an influential member of the Scottish art world: President of the Scottish Society of Women Artists from 1944 to 1947, and the first woman Academician in 1952. She was also a pivotal member of what became known as the Edinburgh School, and her flat was an artistic salon where she befriended and inspired many. Her sons David and Alastair Michie became artists too. Their work is also represented in the University Art Collection. This painting, which was part of the Scottish Art Council Bequest to the collection in 1998, is a later work and shows her favouring a muted, limited palette in gouache, which contrasts with her earlier more vigorous colourful style.